Our leading man in A Civil War Christmas, portrayed by the very talented Manuel Garay, is a symbolic character the playwright named Decatur Bronson. His name is a combination of two war heroes who fought bravely for the Union: James H. Bronson (1838-1884) and Decatur Dorsey (1836-1891), but his story is emblematic of the many black union soldiers who courageously and sacrificially fought and died in what many considered to be the white man’s war. The real-life Dorsey and Bronson were both recipients of the U.S. military’s highest decoration, the Medal of Honor, respectively for their courage and heroism in The Battle of Crater and The Battle of Chafin’s Farm. They were both born into slavery, and upon obtaining their freedom, instead of relishing in it, chose instead enlist to in the Army. 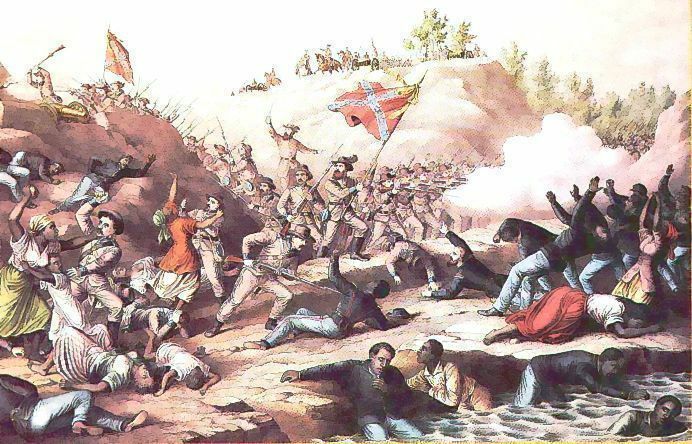 Our character references The Battle of Fort Pillow (also named The Massacre at Fort Pillow), at which neither of the historical characters fought. Fort Pillow, however, was an important conflict in the African-American story. It is considered by many historians to be the most racially charged battle of the war, and the few black soldiers who escaped with their lives remember it as a massacre– with none of their surrendering black comrades being spared. A congressional committee later determined that over 300 black Americans were slain that day. Our character carries with him the burden of that day, along with all the injustices he has lived in his lifetime. His beloved wife Rose (play by the lovely and haunting Essence Brown) was kidnapped off their own front porch and in Bronson’s words, “every Confederate I kill is a bridge to reach her.” His motto– mirroring the slaughter at Fort Pillow– is TAKE NO PRISONERS, and he is determined to kill every Confederate he encounters. His vow, along with his anger and obsession, carry him viciously through the war until one day when he meets a young wannabe Confederate boy with barely any peach fuzz on his face. Raz’s (played by Daniel Frometa) youthful innocence and desperate poverty reminds Bronson a little too much of himself, despite his race and politics. The two share a powerful moment that will be sure not to leave a dry eye in the house. A Civil War Christmas by Paula Vogel runs Dec 14, 15, & 16 at First Baptist Church of Downey at 7pm. 8348 E. Third St., Downey, Ca 90240. Tickets are free. Visit www.fbcdowney.org or www.downeyarts.org or call (562) 923-1261.